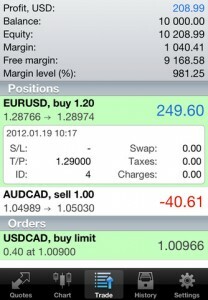 Free financial advice is everywhere, but it’s not every app that provides you with the security and prestige of Forex. 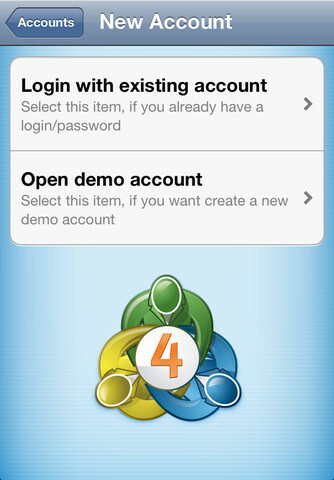 EnterMetaTrader 4, developed by MetaQuotes Software Corp.
You can use this completely free iPhone app to trade currencies with any of the 350+ Forex brokers that use the MetaTrader 4 trading platform. 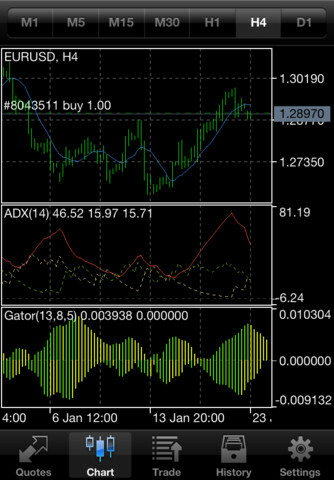 Control your account, complete trades, and use any of the 30 technical indicators for market analysis, including Average True Range, Bollinger Bands, Relative Strength Index, and Standard Deviation. It’s immensely powerful, advanced, and capable of satisfying even the most world-weary of traders. 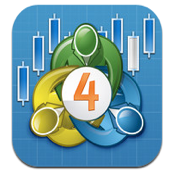 MetaTrader 4 isn’t for the faint of heart, nor is it an ideal free trader app for someone who is a novice when it comes to making trades and analyzing the market. While the interface is very user-friendly, there isn’t a lot in terms of bells and whistles that make it easy for beginners to comprehend that massive amount of data you are inundated with. 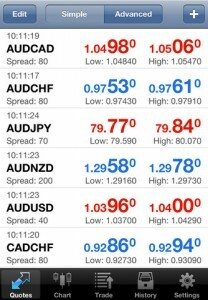 If you need a financial/trading iPhone app with the ability to give you guidance, analysis, and advice, this probably isn’t the best choice for you. 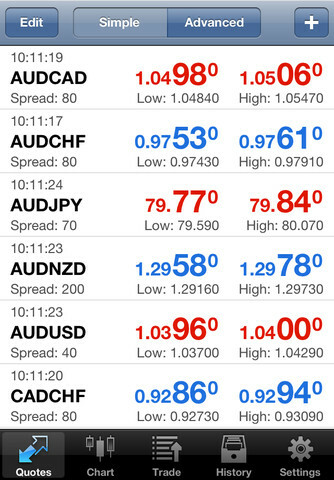 But if you need high-octane, comprehensive data from the market, MetaTrader 4 is definitely worth having in your arsenal. Boy, there is a lot of real-time data to review. If it’s all just too much to take in, we have a suggestion. Try out the “Offline” mode, which includes symbol prices and charts. Easy to follow trading history lets you review your old trades at a glance, while a whole host of chart types and time-frames give you unprecedented control over how you display, track, and manage your trading life. Final analysis: for the whopping price of FREE, the only disadvantage to this handy iPhone app is that you can’t write it off on your taxes. MetaTrader 4 is compatible with iPhone, iPod touch, and iPad. Requires iOS 4.0 or later.